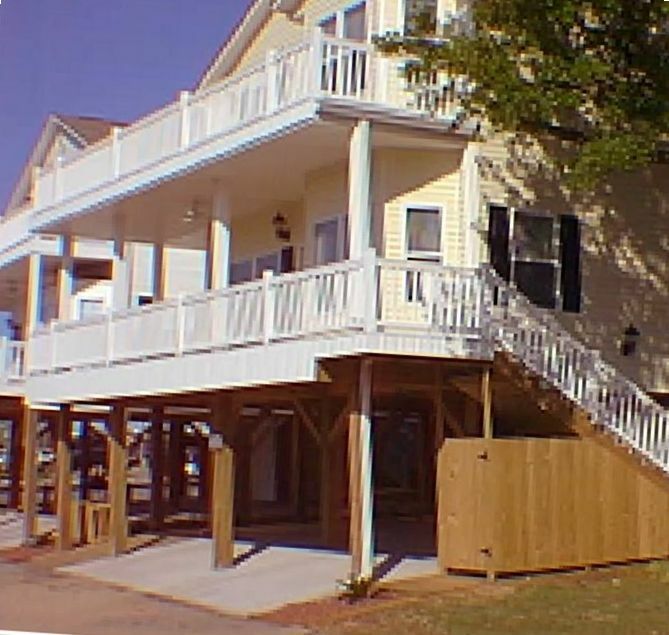 Two story home was built in 2004, has 9ft ceiling and beautifully decorated. Four bedrooms have cable TV and most with VCR or DVD players. Home has covered parking with room for 4 vehicles and golf carts. Overflow parking is available. Home also has picnic tables, grill, swing and outside shower. Home is located in Ocean Lakes Family Campground which is one of the largest campgrounds in the United States. There is a new on site water park added summer of 2016 which includes lazy river, slides, splash zones for little ones etc. Ocean Lakes was voted 'National R.V. Park of the Year' for three years. The campground has a gated entrance with 24 hour security. By far best place we have stayed at while at Ocean Lakes Campground. Have been going to campground for quite a few years and this location was the best by far. Walk out door to the Rec Hall and pools, walk 1 block to beach. On a dead end street so not a lot of cars moving up and down it. Plenty of room and exactly as was described. No complaints from any of us staying (9 of us and all comfortable). I will definitely rent again if available next time I go. Owner was always available and always got back to me on same day if I emailed her. No complaints. This house was superb!! This is our 4th year staying at Ocean Lakes and while the other homes have been good my kids said this was the best. It's on a dead end street right next door to the recreation center and pool area, with lake right across the street, and those taking their fur babies, one of the designated areas for them is right there close by. The home was spacious in every area. All bedrooms with exception of one had doors leading out onto the deck. Plenty of parking space too. Would definitely rent again. My family and I enjoyed our stay and the house so much! It was roomy, clean and close to everything! We will definitely be coming back next year. We stayed here over spring break and loved it! Great house and a great location! Great place for a family vacation!! Very nice and roomy. Cute decorated rooms and nice big kitchen. Had every kitchen utensils and cookware we needed. Convenient walking distance to the pool and the beach. Nice big porch. Lots of room to park. Owner was great to work with and was very helpful. G3 really is the place to be! We absolutely love going to Myrtle beach and almost always stay in Ocean Lakes because it’s convenient and fun for kids. This thanksgiving we had family meet us there and we decided to have a mini vacation and celebrate the holiday. It was our first time at this house and it was perfect. The view of the ocean in the morning from the balcony outside our room was perfect, the view of the pond where the kids were fishing directly in front of the house was nice. It’s close to the pool and arcade and meet and eat so the kids were able to wonder and still be close enough that I didn’t “smother” them. When planning a holiday meal for our family I was nervous that a rental wouldn’t have every thing I needed but they did and more. The kitchen was fully stocked to cook a turkey and all the trimmings. The house is spacious and everyone was able to enjoy being together without feeling too close to each other. We will definitely stay here again. The owners were so nice and helpful and answered every question we had. There are 5 rooms with a master on the main level with a king bed with a bathroom that also opens to the living room area for guests. Upstairs has 2 full bathrooms and 4 additional rooms all with queen beds and 3 have direct access to the balcony. There are TVs in all the rooms and cable for rainy days but It’s the BEACH. the couch in the living room folds into a bed with another fold out oversized chair in the living room. By far our favorite rental so far and the kindness the owners showed and help they offered while planning this trip made it exceptional. We will be back soon.